Enforcer AGM Leisure and Marine Battery 12V 115AH Sealed from County Battery. Buy Online Today. Enforcer AGM Leisure and Marine Battery 12V 115AH Sealed are the most popular batteries in the leisure and marine market. 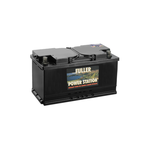 These batteries come with 2-Year warranty with high performance design, maintenance-free and enhanced cold cranking ability.